Self-proclaimed fat girl Willowdean Dickson (dubbed "Dumplin" by her former beauty queen mom) has always been at home in her own skin. Her thoughts on having the ultimate bikini body? Put a bikini on your body. With her all-American beauty best friend, Ellen, by her side, things have always worked...until Will takes a job at Harpy's, the local fast-food joint. There she meets Private School Bo, a hot former jock. Will isn't surprised to find herself attracted to Bo. But she is surprised when he seems to liker her back. Instead of finding new heights of self-assurance in her relationship with Bo, Will starts to doubt herself. So she sets out to take back her confidence by doing the most horrifying thing she can imagine: entering the Miss Clover City beauty pageant - along with several other unlikely candidates - to show the world that she deserves to be up there as much as any twiggy girl does. Along the way, she'll shock the hell out of Clover City - and maybe herself most of all. 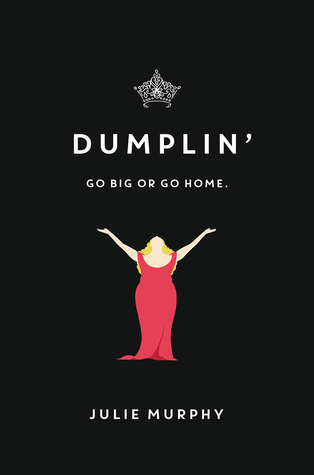 With starry Texas nights, red candy suckers, Dolly Parton songs, and wildly unforgettable heroine - Dumplin' is guaranteed to steal your heart. I loved this one. Seriously. Took me by surprise how much I enjoyed it, and I enjoyed it sooo much that I listened to the entire audiobook in a day. I just couldn't seem to find the restraint to turn it off. While Willowdean has embraced her curvy figure, that doesn't mean it's always easy. And that's what I loved about her. Some days are easy, knowing her strengths and feeling confident. Other days are harder as she experiences vulnerability and insecurities. Life isn't perfect and knowing who you are takes courage each day. She's a girl grieving over the loss of an aunt who understood her better than anyone, and she's a friend who is afraid of being left behind. For Willowdean, the beauty pageant doesn't start out as a grand statement. It doesn't really end that way either. The beauty pageant is for her, and her aunt, and it becomes a representation of real girls, each unique and beautiful in their own way. Murphy got so many things right. Will's best friend Ellen is in a committed relationship and chooses to lose her virginity toward the beginning of the book. Unlike most teen novels, Ellen's boyfriend Tim is a decent, kind guy who genuinely likes Will and loves Elle. It was refreshing that there was no abuse or overly dramatic scenes. The same with the unfortunate falling out between the besties. Sure, there's a bit of pettiness, but it's more about pain and regret. Two girls who are growing up and away from each other, unsure of what that really means. Then there's Will's single-mother and pageant director. They are both mourning the lost of Lucy, a most beloved aunt and sister. Ms. Dickson doesn't want to get trapped in the past, and Will is having a hard time letting go. There is fighting and hurtful words, but there is also respect and reconciliation. They're not perfect. But they love each other. It's a strong family despite the troubles.